This is a White tree of Gondor inspired necklace that I made, using a moonstone cabochon and silver plated wire (1.2 and 0.8 mm). I hope you like it . wow it's so intricate! well done! Could be. Lots of moonstones in the world . 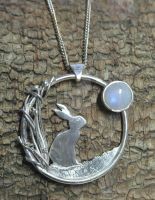 Love the opalescent moonstone and silver tree! Moonstones are awesome ! Thanks!